Today, Girl Scouts enters its second century of Girl Scouts selling cookies! Given that more than half (57 percent) of Girl Scout alumnae in business fields credit the Girl Scout Cookie Program® with developing skills they use today—including money management, goal setting, and public speaking—selling Girl Scout Cookies has helped millions of female entrepreneurs over the past 100 years spark their careers. During Girl Scout Cookie season, participating Girl Scouts across the country show their G.I.R.L. (Go-getter, Innovator, Risk-taker, Leader)™ spirit as they sell delicious cookies, building essential entrepreneurial skills along the way that are imperative to leadership and future success. And the funds from every cookie purchase power amazing experiences for girls year-round, like camping adventures, world traveling, Take Action projects that benefit their community, and more! That’s because all of the net revenue from cookie sales—100 percent of it—stays within a Girl Scout council’s local area to benefit girls. Councils depend on cookie earnings to run their programming, and girls decide how to invest their troop’s portion of the earnings in impactful community projects and personal enrichment opportunities. This season, troops nationwide are also welcoming the return of the Girl Scout S’mores® cookie, the most popular flavor to launch in the 101 years of Girl Scouts selling cookies. 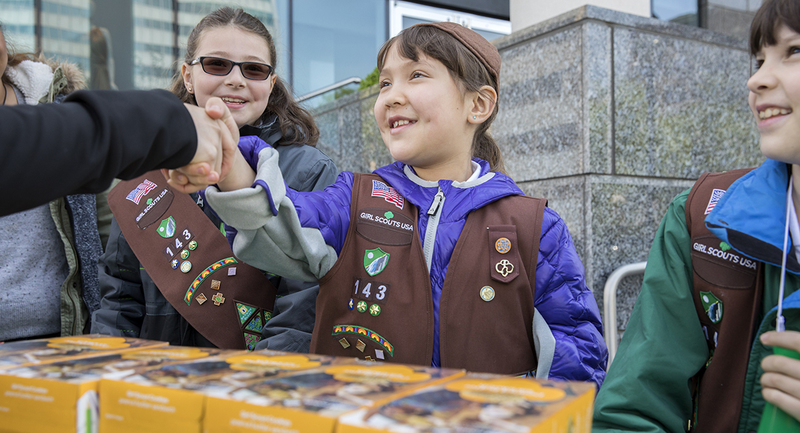 Consumers can fuel transformative leadership experiences for girls and help build the next generation of female entrepreneurs by purchasing Girl Scout S’mores as well as classic favorites like Thin Mints®, Caramel deLites®/Samoas®, and more. Last year, Girl Scouts of the USA debuted two versions of Girl Scout S’mores—a crispy graham cookie double-dipped in a crème icing and enrobed in a chocolatey coating, and a crunchy graham sandwich cookie with a chocolate and marshmallowy filling and embossed with designs honoring Girl Scouts’ Outdoor badges. They’re sure to be best-sellers again this year! For the current season, girls will sell cookies door-to-door and at booths, as well as through the Digital Cookie® platform, an innovative and educational web-based addition to the cookie program through which girls run and manage their Girl Scout Cookie businesses online. Now in its fourth year, the Digital Cookie platform continues to keep Girl Scout programming current and relevant to today’s girls by providing them with valuable business and science, technology, engineering, and math (STEM) skills that prepare them for 21st-century leadership.